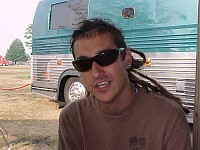 In Music We Trust - INTERVIEW: Less Than Jake: Who The Hell Are They and Where Did They Come From? Who The Hell Are They and Where Did They Come From? IN MUSIC WE TRUST: So how long have guys been doing the warped tour? LTJ: We have done at least a little piece of it over the last 5 years, we done have a year here and there, last year we only played 5 stops, this year we doing a few more shows. You can say we have been all around the Warped Tour. IN MUSIC WE TRUST: How many more years do plan on doing the Warped Tour? LTJ: We don't really know I think it would be really great if we started up with another festival like OzzFest or something. But I really don't know what are options are at the moment. You will probably see us at the Warped Tour again, it is hard not to play on the tour we are friends with all the bands and it is real easy we only play a half an hour at a time. IN MUSIC WE TRUST: So you get along with all the other bands on the tour? LTJ: As long as there is enough beer. But then again we don't get along so well if there is too much beer. IN MUSIC WE TRUST: What are your favorite bands on the tour? 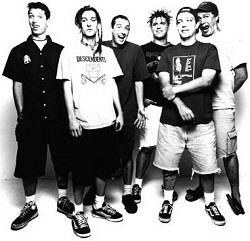 LTJ: I think they are all great bands this year but I am really into the "Bouncing Souls" they are an amazing band we have been touring with them for years and they have really grown as a band they put on a great show and I love their sound. Other then that I would have to say "Me First and the Gimme Gimmes" are a great band. We have done over 150 shows with the guys from "Pennywise" so it is hard for me not to say that guys from "Pennywise" rock! There has not been a day on the tour where I have not checked out those 3 bands. IN MUSIC WE TRUST: So do all you guys hang out then? LTJ: Yeah at the end of day we usually all get together and have a fire and just hangout. It is very cool very mellow. IN MUSIC WE TRUST: So how did you guys get your name? LTJ: What band are we in again? Oh yeah Less Than Jake. We got the name from our drummer Vinnie's parents bulldog Jake. His parents would go out to dinner and bring back food just for the dog, Vinnie had to give up his spot on the couch for the dog. So everything was less than Jake, and so are we. It is also a phrase; 'everything is Jake' is term 1920s gangsters used to suggest that everything was cool, no problems. So Less Than Jake implies that something is wrong or uncool. IN MUSIC WE TRUST: How did the band all meet? 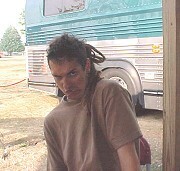 LTJ: From single's ad's mostly. We all were going to the University of Florida and there was this singles meet singles kind of message board there. It kind of sad really the ad was something like desperate top seeking matching bottom and I just called immediately. IN MUSIC WE TRUST: There have been a lot of changes in the bands line up who has been in the band and who is in it now? LTJ: we have been "officially" together since January 1993, but vinnie and me released two demos as LTJ in 1992 with Shaun, x-roadie, on bass. Shaun left to go to New York, I moved to Gainesville, we had a different bass player for a month or two, then we got Roger. After that we got Jessica on sax then Buddy on trombone. Jessica moved away and didn't get up to G-ville much so we got Derron to play baritone sax. After Jessica left the band entirely, we got Lars from Skankin' Pickle, who filled in on one tour. Pete from Slapstick came down after that and joined up to play trombone. IN MUSIC WE TRUST: Where is the band originally from? LTJ: We are all originally from our mothers but before that I think we just one of our dad's sick wet perverted dreams and before that I don't think we were even thought of. But originally Vinnie grew up in Jersey, Buddy and Chris grew up in Florida. We all really did not meet until we were around 18. I was 19 when band really started going. We are now based in Gainesville, Florida. IN MUSIC WE TRUST: You guys did a song on the Scream 2 soundtrack, How did that come about? LTJ: They just called us out of the blue. Wes Craven's daughter or niece maybe really likes our band so he put us on the soundtrack. We had written song just for the movie but they were like maybe you should do a cover song, we were like what the hell and did "I Think I Love You" by the Partridge Family but we had a great time doing it. IN MUSIC WE TRUST: What is the deal with Pez? LTJ: Vinnie and Roger both collect them, and both have pez influenced tattoo's. Their love for Pez creeps into some songs but mostly doesn't get into actual songs anymore. To simplify it, pez dispenses sugar, and is collectible. They always say the only thing that would make it better is if it dispensed nicotine or caffeine. So if the Pez people are reading this "Where are the Less Than Jake Pez dispensers"? IN MUSIC WE TRUST: Are all your shows all ages? LTJ: Every show we do we want everyone to come, no matter what the age? It seems the all age's shows have so much more energy. IN MUSIC WE TRUST: Do you allow people to tape your shows?